In situ U–Pb dating of zircons from five samples of Calabrian augen gneisses shows that their protoliths are Latest Precambrian to Early Cambrian in age (562 ± 15, 547 ± 7, 540 ± 4, 539 ± 16 and 526 ± 10 Ma), and contain Archaean (3.1 Ga), Palaeoproterozoic (1.7–2.4 Ga) and Neoproterozoic (0.6–0.9 Ga) inheritance. 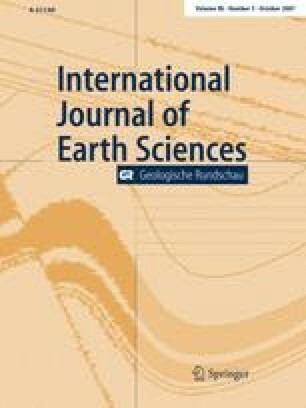 Geochemical signature of augen gneisses is typical of high-K calc-alkaline post-collisional magmatism. Their Sr–Nd isotopic compositions [0.7093 < (87Sr/86Sr)i < 0.7139; −3.2 < ɛNd(t) < −5.4; 1.5 < T DM < 1.7 Ga] indicate the involvement of a crustal component in significant proportions. The Calabrian augen gneisses have, therefore, to be distinguished from the orthogneisses of Sardinia and northern Algeria, and from the porphyroids of Sicily, which are Middle Ordovician. By contrast, the Calabrian augen gneisses show a close similarity to the Pan-African post-collisional granitoids of the northern edge of the West African craton (e.g. the Moroccan Anti-Atlas). This suggests a peri-Gondwana origin and corroborates previous palaeogeodynamic reconstructions attributing the Alboran microplate to the northern margin of the West African craton. Thanks to M. Champenois, C. Rollion-Bard and D. Mangin for technical development of the ion-probe facilities. W. H. Dullo, F. Corfu, D. Gasquet, J. F. von Raumer and A. Rottura are gratefully acknowledged for their constructive criticisms. This study benefited from financial support from CRPG-CNRS of Nancy and University of Bari.